Milwaukee Choristers | One of Southeast Wisconsin's premier community choruses. THANK YOU to everyone who joined us for When Music Sounds at St. Joseph Chapel April 12 and 13, 2019. What a glorious space to share a diverse program that featured the premiere of “When Music Sounds” by renowned choral composer James Q. Mulholland! 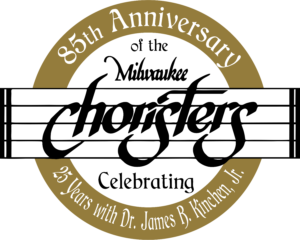 It was the second piece composed for the Choristers in celebration of our 85th anniversary as a community chorus and Dr. James B. Kinchen, Jr.’s 25th anniversary as our music director. Enjoy the December 2018 premiere of “Softly, the Night Is Sleeping,” composed for the Choristers by Dr. Rosephanye Dunn Powell of Auburn University.